Fancy Band is an advanced level project, although the instructions are very clear and thorough, and I’ve had many, many beginner to intermediate students successfully complete this project. It is 15 pages, with 43 clear crisp photos, and a total file size of 963KB. This tutorial teaches you step by step, the techniques used to create this design, some of which were inspired by Dianne Karg Baron and Mr Jorgen Greftegraff. It is wonderful design to create an elegant lasting piece of jewelry. I do suggest you have at least the basic skills and familiarity with wire wrapping before attempting this ring. If you’d like to build your skill set first, please see my other listings for beginner and intermediate level tutorials. 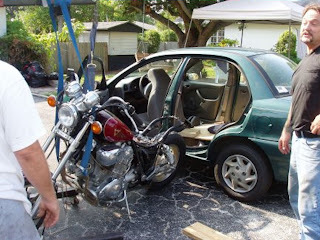 The car is a 1998 Chevy Metro Geo; the motorcycle a Yamaha Virago, also 1998. Gerald and his Dad, spent 4 or 5 days getting the car and motorcycle ‘ready’. They took the rear driver’s side door off, the front passenger seat out, and the back seat completely out. They took the spare tire out, broke the seats down, and put the seats, and the door in the trunk. 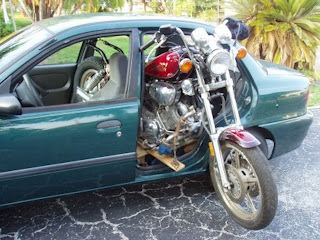 They then took the rear tire off the bike, put it on the rear floor board, and put a heavy thick piece of plywood over that to create a suitable platform for the bike. They also remove the foot pegs, handle bars – the whole front end, tire and front forks – they were put in the space where the passenger seat was. 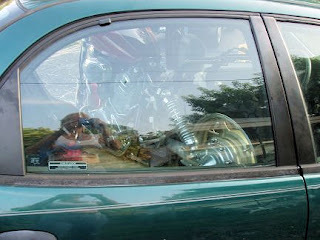 They chain/bolted the bike to the floor board, and chained it to the passenger side window/door support frame. They then taped a tarp over the openings, which came undone and he lost it half way home – in the rain ;). As soon as got home Gerald and my brother Jeff, attached the front forks and tire, slid the bike out enough to attach a cherry picker to it, and hauled it the rest of they way out. 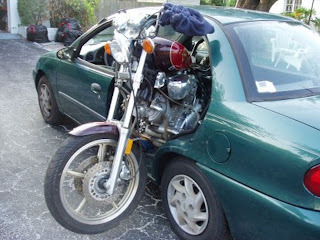 Gerald said folks were hanging out their own car windows to take pictures of his efforts, and I have no doubt – 3 people stopped their cars in front of my house to watch them take the bike out….